Hope your morning is going well. I’ve spent mine happily experimenting with my new air fryer. If you don’t know about them, air fryers are these magical machines that fry food using only air. It’s a far healthier and less messy way to fry foods. So for my first foray into air frying, I thought I’d start with something that I love but that is a total pain to fry the normal way. I decided to make low carb donuts. Donut holes to be exact. I’ve been systematically trying out different cook times and methods to make these donut holes. Like 8 minutes with just air, 9 minutes brushed with oil, 7 minutes brushed with butter. You get the idea. But I am going to be honest with you, I taste tested waaaayyy too many donut holes this morning. I gobbled up the first couple whole, because they were so delicious. But now I really wish I had paced myself. I finally found the perfect combo of butter and cook time, but now I am stuffed to the gills with these addictive cinnamon sugar donut holes. . But onwards and upwards with these low carb donut holes. They are made from real yeast bread dough, so you’ll need to proof some yeast, mix up your dough, knead it and then let it rise before cooking it in the air fryer. I used Carbquik Baking Mix as the flour because it acts quite a bit like real flour. It’s made from wheat, but they’ve converted most of it to fiber to bring the net carb count down. That means that each donut hole has just 1g net carbs. You are going to see sugar in the ingredients, but hold up a minute before you pass judgement. The sugar is needed to feed the yeast. But it’s converted to alcohol and carbon dioxide in the fermentation process so the carbs are cancelled out. You should also know that since the Carquik is made from wheat, it’s not gluten-free like most other low carb and Keto baked goods. So, just a word to the wise. But enough chit chat, now I have a date with some Pepto-Bismol. Cheers! These healthy low carb and Keto donut holes are easy to make in an air fryer. And each donut hole has just 1g net carbs. In a large bowl, mix together warm water, sugar and yeast. Cover the bowl with a towel and allow to rest for 7 minutes until frothy with small bubbles. If it isn’t frothy like the head on a draft beer, then your yeast is dead and you need to start over with fresh yeast. Use a wooden spoon to mix Carquik into the yeast mixture. Mix it until it is a kneadable dough. If it’s too wet to knead, then add a little more Carbquik and if it’s too dry to knead, then add a little water. Make the dough into a ball and use a large knife to cut it into 8 equal pieces. Cover a cookie sheet with parchment paper. Roll each piece of dough into a ball with your hands and place them on the parchment covered cookie sheet. Allow the dough balls to rise for 15 minutes. They will not rise a lot, but you’ll be able to tell that they are a bit bigger. While they are rising, set your air fryer to 350 degrees F and preheat it for 10 minutes. Brush four of the dough balls with melted butter on all surfaces and place in the basket of the air fryer. Air fry at 350 degrees F for 10 minutes. Remove the donut holes from the air fryer and set aside to cool a little bit. Repeat the process with the remaining dough balls. Once the donut holes are cool enough to touch, brush them again with melted butter on all surfaces. Mix together cinnamon and sweetener in a medium sized bowl. Roll the donuts in the cinnamon mixture until coated on all sides. Best when eaten warm. Can be reheated in the microwave for 10 seconds to soften them back up. 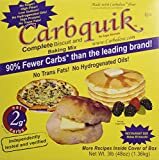 If you liked this low carb Carbquik Baking Mix recipe, then you might like my recipes for Yeast Bread Dinner Rolls, Blueberry Ricotta Pancakes or Chicken Pot Pie with a Biscuit Crust. Yep, they are low carb and low calorie (114 calories!) so you can splurge a little. I’m still on the fence about getting an air fryer but then I see great recipes that can be made with one and I want to go out and buy an air fryer NOW!! Love these doughnuts! Not sure I can buy carbquik here in Italy but will look out for it! I was worried that it would be just one more appliance junking up my countertop, but I’m really glad I took the plunge. This is sure to crave any donut craving while eating Keto. This recipe is a game changer when it comes to keeping a diet on track. I know! I’ve been missing fried donuts so much. 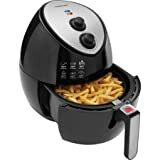 I am simply amazed at how many things you can make in the air fryer. I want to try these donut holes. So many things. I can’t wait to try it out with other low carb recipes. I’m sure you didn’t mind trying that many donut holes to give us the right recipe 🙂 they look so delicious! You’re right. They were pretty tasty, I have to say.